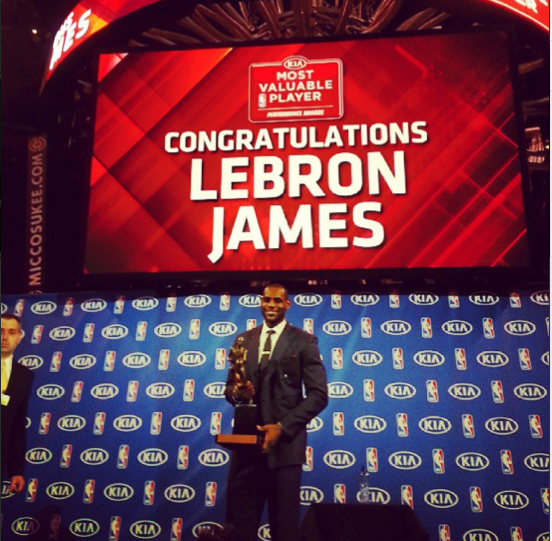 Yesterday, NBA superstar, LeBron James, accepted the trophy for league MVP joining the ranks of Bill Russell, Wilt Chamberlain, Kareem Abdul Jabbar, and Michael Jordan as the only players to win the MVP trophy at least four times. He and Bill Russell are the only players to win the award 4 times within a 5 year timespan. James gave a very touching acceptance speech in which he thanked his mother, his fiancee, and his fiancee's parents. Can someone please explain to me why someone of LeBron James' caliber doesn't have any endorsements on television? Magic Johnson brought this up during the NBA Halftime show and I totally agree with him. How can James be the two time MVP and the game's best player but doesn't have one commercial on television? Chris Paul and Blake Griffin have commercials, but not LeBron James. Just doesn't make sense. Nobody cares about him leaving Cleveland (well except those three or four Cleveland fans). I really like LeBron. I can't say I follow the game that closely, although I'm gonna try to catch must of this next series with the Bulls. His "announcement" flub...I think that most people are over that. As for endorsements, I'm sure people are hitting him up. He may not consider it to be worth his while. He ain't hurting for money, so some offers may not be worth his time. Who knows...it just won't surprise me if he has decided to dial back on the endorsements and not vice versa.